Does it really take 20,000L of water to produce 1kg of beef? We’re living in an age of fake news and fake meat, if you follow the headlines. In an encouraging trend, the recent rise of fake news has led to a new era of ‘fact checking’ by individuals and journalists, according to leading journalism website Poynter. “Around the world fact-checking is “booming”, Poynter recently wrote. Fake meat, on the other hand, largely involves producing meat in a lab. 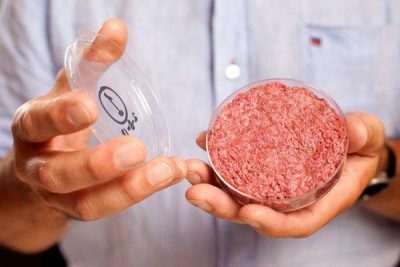 Synthetic meat, test tube meat, cultured meat, meatless meat, plant-based meat, franken-meat, clean meat – call it what you will, it has been attracting some impressive investment backing from millionaires and giant meat companies in the past year, and with it, spiraling media interest. It seems incongruous to anyone with a background in agriculture that something as natural as a cow eating grass could be considered a terrible thing for the planet, but that is a key premise upon which this new industry is being built. What has been interesting in this era of fake news and heightened sensitivity about the need for fact checking has been a noticeable trend that has been evidence in many articles about fake meat. That is, they almost invariably repeat without apparent need for challenge the claims of the commercial proponents of fake meat against real beef, presenting their views as incontrovertible truths about conventional agriculture without any evidence of attempting to verify the veracity of their claims. But the reality is the information that is typically used to back their claims is often far from incontrovertible or unchallengeable. A recent Sydney Morning Herald article reporting on the global race to grow meat in labs explained that the trend is seen as a way to produce protein in a more environmentally sustainable way. In support of that point it quoted the UK-based Institution of Mechanical Engineers, as saying one “kilogram of meat requires between 5000 and 20,000 litres of water to produce, while one kilogram of wheat requires between 500 and 4000 litres of water”. Do these figures really hold water? Does it take as much as 20,000 litres of water produce a single, solitary kilogram of beef? Or even as much as 5000 litres? Lee McNicholl, a cattle producer from western Queensland, asked the same question earlier this week. These were his calculations: “Say a two year old grassfed steer dresses 300kg and Lean Meat Yield is 60 percent. Therefore 180kg of beef is produced. Say the animal drinks 40 litres /day (generous) for 730 days. That equals 29,200 litres divided by 180kg = 162 litres per kilogram. A further search showed the Institution of Mechanical Engineers made the above statement in a 2013 report titled “Global Food. Waste Not, Want Not”. However, while that statement was referenced in the report, the specific reference was missing from the list of references at the end of the report. A spokesperson for the Institution kindly responded to our inquiry and told us the source of the statement which was a 2008 magazine article produced by the Water Footprint Network, and written by the network’s founder, Professor Arjen Hoekstra, and also a UN report referencing the same source. In the article Professor Hoekstra actually wrote that producing one kilogram of boneless beef required about 155 litres of water, taking into account only the water used for drinking and servicing that animal. However, when you added in 1300kg of grain, 7200kg of roughages (pasture, dry hay, silage and other roughages), and the water required to grow those feed sources, he said the water footprint of 1 kg of beef would add up to 15,500 litres of water. Professor Hoekstra, from the University of Twente in the Netherlands, is the inventor of the Water Footprint concept, a method used to account for the total amount of water used to produce something. This model is used widely in the environmental movement, but has also come under serious challenge by others in the academic community about whether it is a fair and accurate way to measure actual water use. Simply comparing the water footprints of grain and meat does not provide helpful environmental information, water resource economist, and former head of research at International Water Management Institute Dr Chris Perry wrote in a 2014 article in the Agricultural Water Management journal. Dr Perry said calculation procedures adopted in most estimates of water footprints are flawed, and that water footprints are incorrectly assessed on an absolute rather than a relative basis. A key concern was that ‘Water Footprints’ made no allowance for whether a producing area is water- plentiful or water-short. “One must consider the scarcity or abundance of water and land, as well as downstream water uses to evaluate the significance of any environmental impact when compared to the status of these variables in the absence of grain or meat production. Simply comparing the water footprints of grain and meat does not provide helpful environmental information. Dr Perry’s analysis would suggest that the source of the original 5000-20,000 litre claim is far from water-tight and one that should not stand alone as incontrovertible truth. Research led by the University of NSW in 2010, funded by Meat & Livestock Australia, found that water used to produce red meat in southern Australia was 180–540 L/kg of hot standard carcase weight. Peer reviewed research published in Agricultural Systems using the Life Cycle Assessment model to quantify the environmental impacts of Australian beef production found a 65 percent reduction in consumptive water use, from 1465 litres/kg of liveweight to 515 litres/kg of liveweight over the last 30 years, from 1981-2010. Previous media articles have reported claims that it takes between 50,000 and 100,000 litres to produce a kilogram of red meat. But these reported measures count every single drop of water that falls on an area of land grazed by cattle over the space of a year. And they do not take into account the fact that most of the water ends up in waterways, is used by trees and plants and in pastures, not grazed by cattle. “These calculations therefore attribute all rain that falls on a property to beef production, whereby the water is clearly being used for other purposes, such as supporting ecosystems” MLA explains in its Target 100 page. Not only do the claims of fake meat advocates about real meat appear to go largely unchallenged, there also appears to be a scarcity of questions asked the detail of processes used to actually produce lab grown meat, and to grow and distribute it large volumes. More media attention on the actual environmental impacts or water footprints of commercialising and mass-producing this ‘meat’ would add important perspective to the issue. They also forget to calculate the amount of water RETURNED to the earth, via defecation and urination. Firstly green grass is very high in water. Does anyone factor in the water that aminals urinate or the moisture in manure. Most of the water consumered returns to the soil. Lost is via transpiration in plants or evaporation or sweat or moisture in the air the animals exhale. Secondly if it rains on a paddock with no livestock is water still used/wasted? The debate seems to rage around stock to be slaughtered however if we dont use the beast for food but simply allow it to live in the environment like roos it will still consume the same amount of resource, and its life will have been meaningless. The old rules of thumb were 10 000 gallons for a tonne of steel and 40 gallons for a cabbage – but ultimately all the water should end moving through the hydrological cycle? Show a politician a way to tax the carbon cycle or tax the hydrological cycle – and whoopee – we have a new debate about a new cash cow? facts don’t matter. those with the $$ anfd influence push whatever agenda they want. like arguing with a cretin, it’s a waste of time. G’day Ivan, sorry but your comments are inaccurate and don’t help to compare “apples with apples”. The average abattoir consumption is 8600 Litres/ 1000 Kg of of Hot Standard Carcass Weight as provided by the Australian Meat Processors Corp.. At 60% Lean Meat Yield = 600 Kg of beef per 8600 Litres which is 14.5 Lt/ kg of beef . If you add this to my figure of 162 Lt /Kg of beef you get 177 Lt/kg of beef produced which is still a long way from 20,000 Lt/Kg of beef . 1 litre of water will cover 1 squ mtr to the depth of 1mm, ergo, there are 10,000 litres of water/hectare in 1mm of rain, so 500 mm of rain per annum is 5,000,000 litres of water. Divide that by the number of kilograms of beef produced and will give you whatever. But it is total rubbish. Remove the wheat/cattle/sheep, whatever from the land and it will not change the rainfall one iota. The only possible ramifications for anybody else but the farmer, is whether that water is available to anyone else. And as no water will run off into the creeks or rivers until the soil in the catchment reaches field capacity, its just crap. This factoid originated in California where most of the agriculture is irrigated and the cattle end up in feed lots, but in Australia, most of our stock run on rain fed pasture and live on grass, a self evident fact that the anti-farm brigade do their best to wilfully ignore. No mention of the water content and fertilising effect of the urine and faeces excreeted; no mention of the fact that grazing animals are essential for soil health; no mention of methane emitted by bovines not being an environmental problem. What about the amount of water to produce sugar as it is the main ingredient for lab grown meat. People will believe whatever they want to believe. You know it really starts getting absurd when natural rainfall is counted as the water required to grow something. I guess when a flood happens that really bumps up the amount of water used to create a kilogram of product. Of course if the product is not being grown, then the rain does not fall. You can use their reasoning to say the dwellings these people live, work and use the services of stop rain from reaching the ground that ordinarily would, thus they consume large amounts of water as well. As I have got older you really start to realise how silly many people can be and many of them hold positions of power and influence.